Without going into the intricacies of metallurgy, it is a good idea to take a look at what your anchoring tackle is made out of. This will give you an understanding of what you may expect, or may need to look out for. It may also help you to recognize potential weak links and thus avoid them. 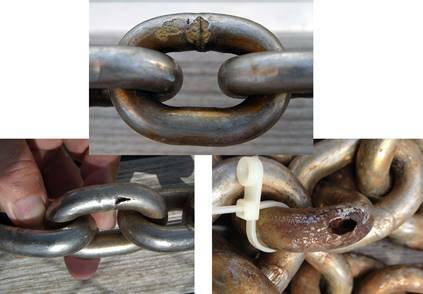 Mixing different metals in the various bits of anchor tackle can cause galvanic corrosion with the presence of moisture and salt in the chain locker, or seawater – an excellent electrolyte. Of particular note here is the problem of combining a galvanized anchor with a stainless steel shackle or swivel (or visa-versa). Zinc (used for galvanizing) and stainless steel are far apart on the galvanic scale. Combining components of such disparate metals can lead to corrosion and potential serious problems. Steel is the most common metal used in anchoring tackle. It comes in many different grades from regular “mild” steel (plain-carbon steel) to high tensile and tool grade steel (high-carbon steel). Unprotected (carbon) steel rusts readily when exposed to air and moisture. This iron oxide film (the rust) is active and accelerates corrosion by forming more iron oxide. Because of the greater volume of the iron oxide, this tends to flake and fall away. To help protect this easily oxidized (= rusted) metal, it needs a protective sacrificial anode or a coating made out of zinc. Adding this coating is called galvanizing. There are two basic methods for doing this: electrolytic and hot-dipped. Electrolytic galvanizing applies a very thin and even coating of zinc to the steel. Hot-dipped, where the steel is literally dipped in molten zinc, applies a much thicker coating, which tends to be uneven and rough. When selecting tackle such as an anchor, one must also take into consideration how it was manufactured. This will include whether it was drop-forged, welded, or cast. With the latter perhaps being the weakest of metals. Personal experience has shown cast iron to be quite brittle. Perhaps the best metal for an anchor is hot-dipped galvanized, drop-forged steel that is shaped by hammering when the metal is red hot. This can be used to construct non welded, one-piece shanks or entire anchors. This is very different from casting, even though the anchors may look the same. The grain structure in the metal of a drop-forged anchor aligns in a manner that reduces brittleness and increases strength. Welding, if done properly, can be very strong but can also suffer from cracks that only x-rays can detect. Aluminum is weaker and notably much lighter than steel. However, if correctly engineered, the tensile strength issue can be overcome. A prime example of this is the Fortress anchor. Other anchor manufacturers have brought out aluminum versions of their anchors, which they subsequently withdrew, as they were not as strong as their steel counterparts. 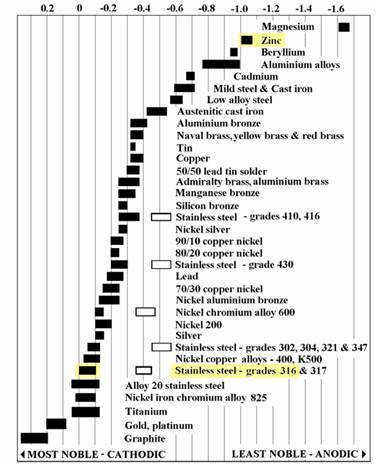 Of note is that aluminum is close to zinc in the galvanic table. Therefore, using a galvanized shackle with an aluminum anchor should pose no issues. A chief characteristic of stainless steel is that it is smooth (and shiny). Therefore, stainless steel shackles do not lock as well as galvanized and may come undone in the most unfortunate of times. Stainless steel shackles in particular must thus always be seized with (Monel) wire. Stainless is also more brittle and also not as strong as so called mild steel. Stainless steel differs from carbon steel by the amount of chromium present. Stainless steels contain sufficient chromium to form a passive skin of chromium oxide, which prevents further surface corrosion by blocking oxygen diffusion to the steel surface. It also blocks corrosion from spreading into the metal's internal structure. Due to the similar size of the steel and oxide ions, they bond very strongly and remain attached to the surface. However, this passivation occurs only if the proportion of chromium is high enough and oxygen is present. In low-oxygenated warm water (Caribbean) or mud, this skin will break down and corrosion (rust) will start. This same problem can occur in underwater keel bolts. Rust will also occur in hidden crevasses which stay wet and or oxygen deprived. Stainless steel is apparently not necessarily entirely homogenous in composition. Small specs of mild steel in it will rust over time causing pitting. This may then expand internally, weakening the overall piece of hardware. Stainless components may thus show little sign of deterioration prior to catastrophic failure. For more on this, please see the following section on swivels. Welding stainless steel can also create sites of corrosion. This is commonly known as weld decay. (see discussion on chain below) It is brought about by the heat of the welding process causing the chromium present in stainless steel to combine with any carbon present to form chromium carbide. The steel in the vicinity of the weld is thus depleted of its chromium. This problem can be overcome by adding costly titanium to the alloy. Titanium has a greater affinity for carbon than chromium. During the welding titanium binds the carbon to form titanium carbide and thereby leaving the chromium behind to create the passivation layer. Chain links are made out of steel rod segments that are bent around a jig and then welded. Depending on the grade of the steel and the quality of the weld, this can be the location where rust sets in and degrades the chain. Most chain aboard small vessels is galvanized steel. (See chapter on Chain) Cruisers, who want to keep their decks free of rust and have heard that chain flows more compactly into the locker without kinking if made of stainless steel, often wonder if the far more expensive option of stainless steel chain will prove more sensible over the course of their lives. Adrian Pringle shared his experience with stainless steel chain complete with photos, which he has kindly allowed us to reproduce here. 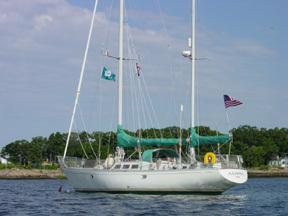 A full account of his experience can be found on the Ocean Cruising Club website in the Flying Fish Journal Issue 2007-2 under the title “The Cost of Anchoring”. He had had serious corrosion issues with a stainless steel chain: After just three years of use it had corroded to a point where it had to be replaced. The manufacturer exchanged this. After only 50 days of use, the new chain showed signs of rust – worse yet, he found a cracked weld. Some time later, on retrieving his anchor after a storm, he noticed severe pitting, with some links corroded by 20%. This time the manufacturer informed him that one should not use grade 316 stainless steel for anchoring. They stated it is unsuitable in low xygen conditions, such as warm water or in mud. Grade 318 would be better, but only if it was washed off with fresh water after use. The manufacturer did replace the chain a second time – with grade 318. We look forward to the next instalment of this ongoing story. Copyright © Adrian Pringle s/v Lalize. Reproduced with permission. Cracks and pitting in stainless steel chain after just 50 days of use. To date we have shunned using swivels, viewing them as an unnecessary weak link in the components connecting the sea bed to our boat. Yes, we have swung at anchor for weeks at a time while cruising. Where the wind was heavy, our anchor veered as a good anchor should. In light wind situations we did note that our chain was occasionally twisted, but this always corrected itself when we weighed anchor. The twist cannot get past the toothed wildcat on our windlass, so there is no chance that the twisted chain would find its way into our chain locker. The anchor simply spins while coming up and any twist is straightened out. A second reason many people opt for a swivel is that they fear that the protruding shackle pin might get stuck on the bow roller when deploying or weighing anchor. Unless the bow roller assembly has been very poorly designed or the shackle is overly wide, this should not be an issue. We have literally anchored thousands of times, sometimes two or three times in one day and have never seen this happen. Once deployed, the anchor will be out of sight and you need to ensure the rode stays securely attached. Your chain should thus be attached to the anchor with a sturdy shackle. If you have a rope chain combination without a rope-to-chain splice, then you need another large shackle to tie the rope rode off to with a knot that will not move and cause chafe. Many people opt for a shiny stainless steel shackle. Just consider that stainless steel is, by its very nature, smooth and the pin is thus actually inclined to unscrew itself. The shackle pin also has areas at either end that will remain moist with low or no oxygen. It is here that the shackle may corrode and ultimately fail. We would suggest using a galvanized shackle instead. As the galvanized shackle’s surface is rough it tends to bind and not open easily. Whatever you wind up using, make sure the shackle pin is secured or ‘moused’ with high grade monel wire. As opposed to stainless steel or copper, Monel® is inert and will not react with the metal shackle. All stainless steel is not created equal. There is a lot of really high quality material available – but lesser quality may not always be discernible. Shackles must be sized as large as possible. Always go for at least one size bigger than the chain and seize (mouse) the shackle with Monel wire. Stainless shackles have a smooth thread and open more easily than galvanized. We personally find little need to have a swivel on our rode – even with an all chain rode. If you think it necessary to have one, buy the best. The Ultra flip swivel may be worth considering. When your anchor is on board, always secure it at the bow with lines to a cleat or other solid point and slack off the tension to the windlass. Holding the anchor with the windlass puts undue strain on the windlass, the chain, the shackle and, if you have one, the swivel.